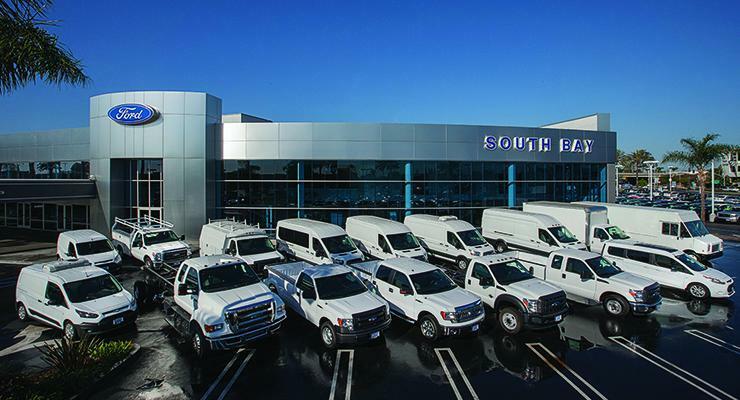 As the largest Ford Commercial Service Center for 20 years and running South Bay Ford Commercial has improved the operation of business fleets throughout the U.S. by fulfilling a high volume of service, parts, and upfit requests. Our state-of-the-art 60-bay service facility is full of Ford Motor Company Qualified Vehicle Modifier certified experts, who are here to help your business every step of the way. With the resources to both deliver nationwide and produce custom-built vehicles, we are dedicated to getting our clients on the road with optimal efficiency. At South Bay Ford, our interests are solely aligned with your business in mind. From an optimum service experience to a lifetime of joy with your genuine Ford product, fleets far and wide we are the epicenter of fleet service in, and around, Los Angeles. Along with offering skilled professionals, who are determined to get your hard-working crew back on the road faster, the Commercial Service Center at South Bay Ford also offers conveniences like complimentary Wi-Fi to assure that any work that can completed is not held up while any truck in a business’s fleet is being serviced. The Commercial Service Center at South Bay Ford also prides itself on being more than an average service center or truck stop for any driver. Any business who keeps its drivers on the road constantly knows that their drivers often miss out on a home-cooked meal. Fortunately, the Commercial Service Center at South Bay Ford even has this service covered. Thanks to free, made-to-order meals at our exclusive in-house bistro your business’s drivers will feel like they are back home with mom all while their baby is being cared for. Your employees even have a chance to relax at South Bay Ford’s reception area. With two 70" projection screens, complete with up-to-date reading material and even an exceptional shoeshine station to keep them looking sharp no matter what position they hold. An on-site Enterprise Rent-A-Car representative and a first-rate shuttle service are also provided for your convenience. Enjoy exceptional service today at South Bay Ford Commercial at a value that can't be beat.